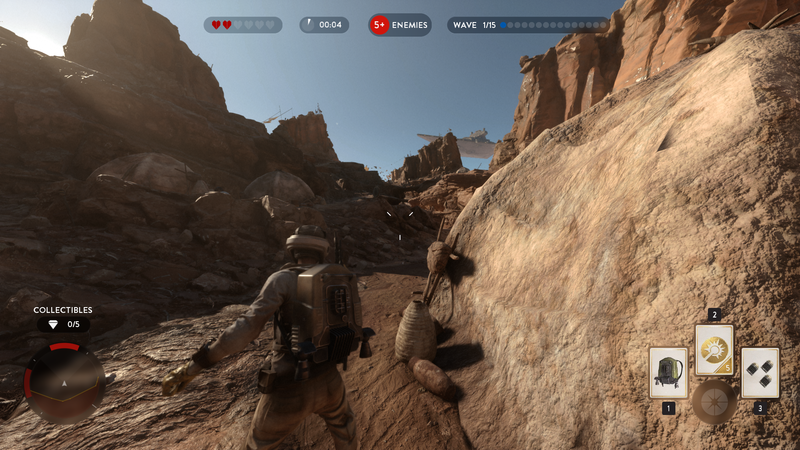 Star Wars Battlefront has launched, which means many a home is now shaking with the sounds of lasers and air-sucking implosions, as well as the whoops of victory and groans of defeat. 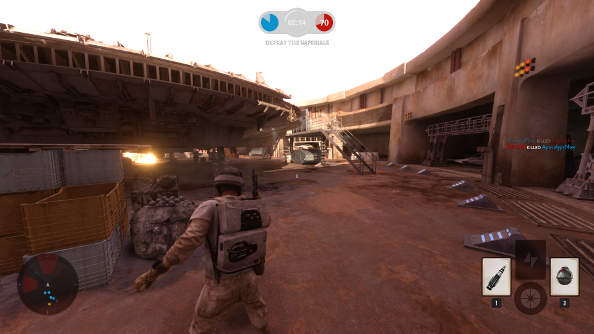 The force appeared to be with Battlefront during beta, but now that it’s launched, is it a stable PC port, or do we have another Battlefield 4 on our hands? Tested on a Intel i5-3570K @3.40 GHz, 8 GB of RAM, GeForce GTX 970, Windows 10. I can’t think of another Star Wars game that feels to authentic, so much like I’m sprinting through gunfights and battles from the films. Each map I’ve played in has been lavished with details both grand and minute that make me forget that Hoth and Tatooine and Endor aren’t real places. Battlefront is a good looking game, but it’s the art direction and extremely detailed assets that look like they’ve been plucked right out of the movies that make it such a pleasure to just stare at – not that there’s much time for staring when health is so fleeting and laser fire so relentless. Each battle is a fast paced, explosive affair, where fights are happening all around, transforming spaceports, battlefields and primeval forests into trance festivals full of multicoloured streaks rushing through the air. And even when it’s looking its best, Battlefront’s performance doesn’t suffer. 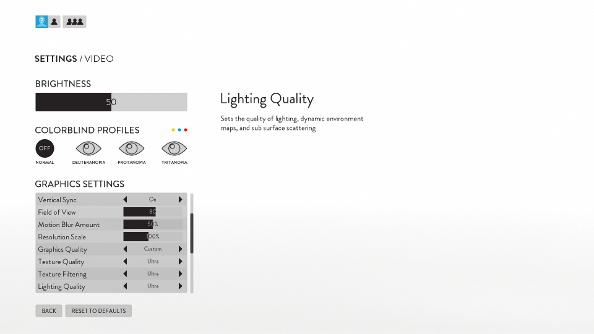 Before we dig into that, though, let’s take a look at the graphics options. DICE have crammed in most of the customisable settings that you’d want from a good PC port. First off, there’s a field of view slider, something that really should be standard, but is so often forgotten about with PC ports. So it’s off to a good start. And if you don’t like to faff around, there are four graphics presets that you can use, from ultra to low. If you prefer to tinker, then you’re covered as well. TXAA and FXAA, texture quality, texture filtering, lighting quality, shadow quality, effects quality, post-processing quality, various mesh options, ambient occlusion… it’s a long list that will let you tweak to your heart’s content, and that’s without constantly having to restart the game to witness the impact. Conveniently, a brief description accompanies each setting, so you know what you’re messing around with. Battlefront also does a good job of catering to the colorblind, providing four different colour profiles: normal, deuteranopia, protanopia and tritanopia. The exceedingly steep requirements can probably be taken with a pinch of salt. The official system requirements recommend at least 16GB of RAM and a GTX 970 or equivalent, and my experience of both beta and launch versions makes me think that these requirements are a bit bloated. Using auto-detect, the game put my settings at high, but upgrading them to ultra and turning on TXAA didn’t faze my rig at all, despite being just below the recommended system requirements. Indeed, I’ve been able to play at an extremely stable frame rate of 60 all day. I’ve been pleasantly surprised to find that this has been the case across all of the maps and modes I’ve tested, from the huge 40-man Walker Assault mission on Hoth to aerial battles above Tatooine. Everything I threw at it, my PC handled without breaking a sweat. If you’re closer to the minimum requirements, however, you might need to turn things down a bit. 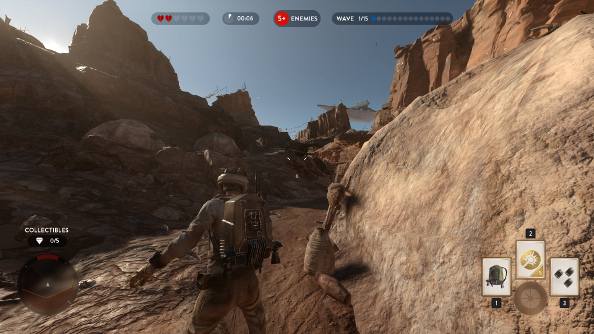 At high, Battlefront still has the power to impress. The most noticeable differences are in the decreased complexity of the shadows and a reduction in the quality of reflections and lighting. In motion, it’s hardly noticeable at all. If you’re struggling to maintain 60fps using ultra settings, then knocking it down to high isn’t much of a price to pay. Even on its lowest settings, with anti-aliasing turned down to FXAA low, its perfectly serviceable. Some objects in the distance become invisible, and the overall detail of the maps is obviously reduced, but it’s hardly an eyesore. One of the most impressive things about Battlefront is the sound design, something DICE have always had some skill with. It’s one of the best sounding shooters, definitely the best sounding Star Wars game, and I’ve been annoying my neighbours all day by turning the volume way up and just delighting in the cacophony. Audio options aren’t as extensive as the graphics settings, but they do cover most bases. Three output options are available enhanced stereo, surround sound and Dolby Atmos, and you can switch between four dynamic range presents, depending on if you’re using headphones, a home cinema-style setup, using speakers or a TV. Continuing the theme of actually offering decent customisation options, Battlefront is also blessed with a fair number of things that you can tweak to get the perfect control setup. Sprint and zoom can be swapped from hold to toggle, invert flight and invert look are separate options, and sensitivity of vehicle and soldier controls can be fiddled with, without affecting each other. 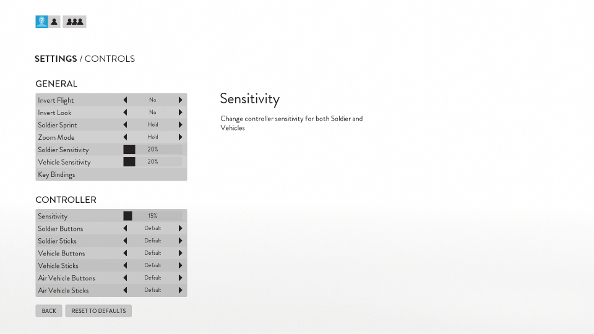 On mouse and keyboard, all controls can be altered, while controller users at least get four different presets to choose from. How much feedback the game gives you is up to you, as well. Jump into the gameplay menu and you’ll be able to turn off the HUD, or just switch off specific aspects of it, like partner outlines and the kill log. You can even change completely unimportant things, like making third-person mode the default view, even though you can switch between that and first-person at the click of a button. I expected to be punished for playing on day one, given my experiences with DICE’s last game at launch. But no, so far things have been incredibly smooth, both on the server side of things and in terms of performance. I’m surprised. Surely it’s a trap. There is one serious issue, though, even though it’s one we all knew was coming: there isn’t a server browser. Battlefront does have dedicated servers, so it’s a bit mind boggling that they aren’t accompanied by a way to browse them. It leads me to worry about the game’s ability to foster a community and clans. You can make parties, but for some reason they are restricted to eight people, so it’s going to be a real hassle to create matches for just you and your friends. This is all especially disappointing given how much control the Battlefront gives players elsewhere; it just seems antithetical to the rest of the game. 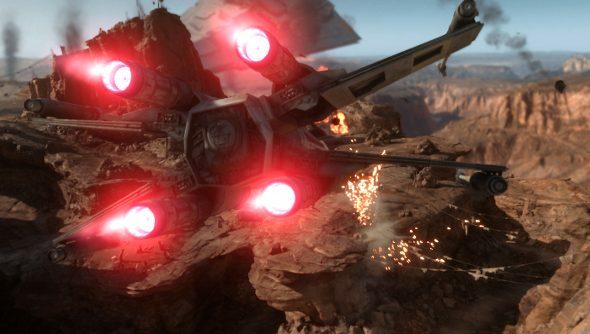 Despite this glaring omission, Battlefront is proving to be an impressive port. It’s fat with sci-fi eye candy, sounds incredible and has an abundance of PC options. If you’re still trying to figure out which version to play, rest assured that you’ll be in for a smooth ride on PC.